Deposed Posh boss Dave Robertson mingling with fans before a game at Preston. The Peterborough Independent Supporters Association (PISA 2000) have praised outgoing Peterborough United manager Dave Robertson for his enthusiasm and passion. The largest Posh supporters group regretfully agreed with the decision to part company with Robertson, but they wanted to place on record their gratitude for the effort he put in. A PISA statement read: “PISA 2000 would like to place on record their thanks and appreciation to Dave Robertson for his service at our football club as Academy Director and more recently in his role as first-team manager. “Dave took on the manager’s role at a time when we were looking towards the wrong end of the League One table, and his unquestioned passion and enthusiasm for Peterborough United helped steer us to safety, narrowly missing out on the play-offs. “To be looking for a new manager so soon after the last time is particularly disheartening, but having made such a poor start to the season, it is felt that this is the best decision for the club going forward. “We thank Dave for his time at the club, and he will always be credited with relaunching the academy that is starting to bear fruit now, and will do further in the future. Last season, he gave us belief in our club after a poor campaign and recorded a memorable win away at Sheffield United, a feat that Posh had never previously managed. “He will always be welcome back to London Road and we look forward to watching the next crop of youngsters - that he has helped nurture - who pull on that famous blue shirt. “PISA 2000 are fully behind (chairman) Darragh MacAnthony in his renewed efforts to find a new managerial team, and Grant McCann in his forthcoming caretaker spell. 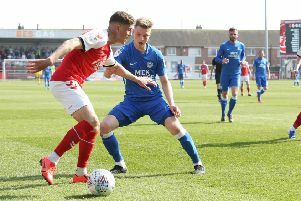 “We appreciate that Posh supporters have become disillusioned with the club’s results in the last few weeks, but the season is still young, and we would encourage them to get behind the players and the new management as we attempt to achieve our aims for the campaign, hopefully resulting in promotion, starting next week away at Oldham. “We would also encourage the Posh faithful to fully support the chairman who has made the brave decision to act now and rescue this season. He has come under criticism in recent weeks and months, but we must never forget that good times he has brought too Posh, and the success he wants to bring in the future.